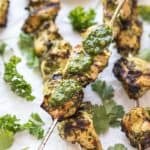 Paleo + Whole30 Chimichurri Chicken Skewers – a delicious and healthy 30 minute chicken kebab recipe! 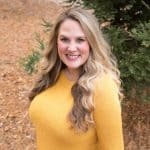 Gluten free, grain free, keto, dairy free, sugar free, low carb, clean eating, real food. 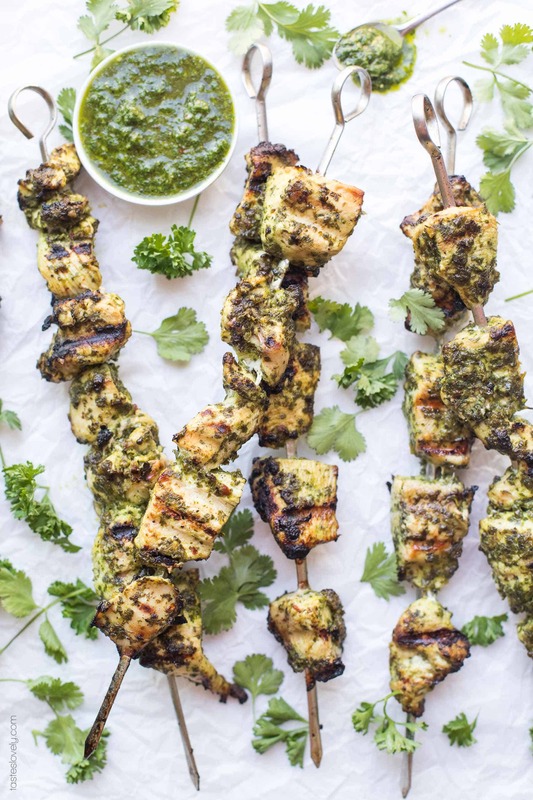 I can already tell these Paleo + Whole30 Chimichurri Chicken Skewers are going to be on repeat all summer long. Such a perfect summer recipe! Full of flavor, light and healthy, and I can grill it outside without heating up my house. I’ve already shared my love of chimichurri sauce. It is made with cilantro, parsley, garlic, red wine vinegar, olive oil, salt, pepper and red pepper flakes. So bright and flavorful and just screams summer. I’ve already shared how I love to serve my Skirt Steak with Chimichurri Sauce, and tons of you love that recipe too. 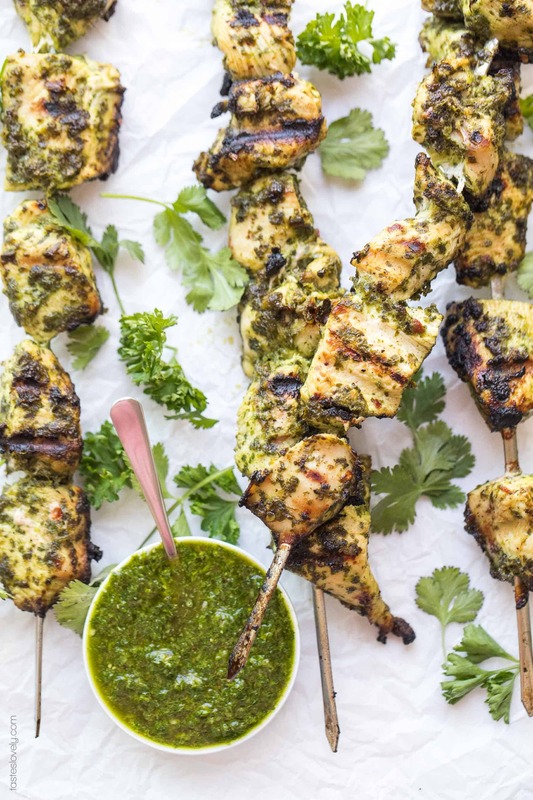 You’re really going to love this chimichurri sauce on chicken kebabs. It’s so simple to make. 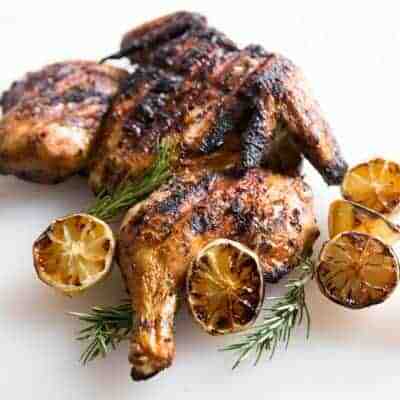 You marinate the cubed up chicken in the chimichurri sauce. You can marinate it for as little as 10 minutes if you’re in a hurry, or marinate it for a day if you’ve planned ahead. Then you just poke the marinated chicken cubes onto the skewers and grill over medium high for 10-15 minutes. Since the chicken is cubed, it cooks really fast. 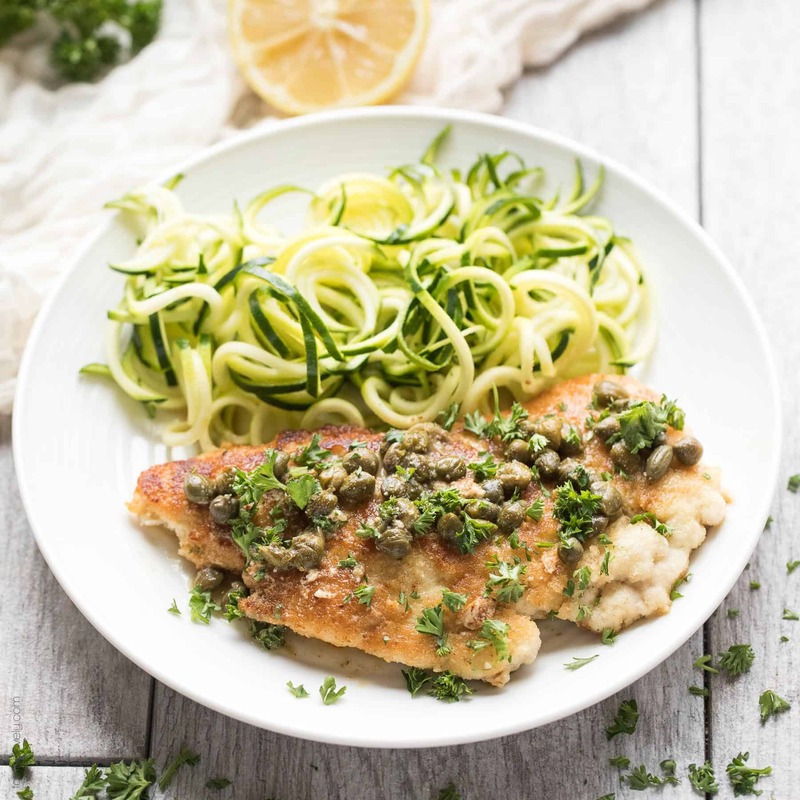 I love a good 30 minute dinner recipe! 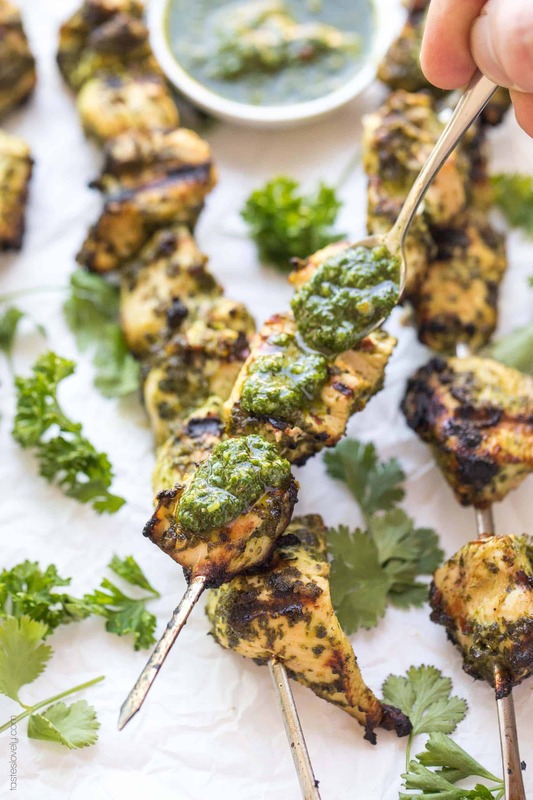 I serve the paleo + whole30 chimichurri chicken skewers with additional chimichurri sauce (can’t get enough! ), and either a light salad or some roasted vegetables. 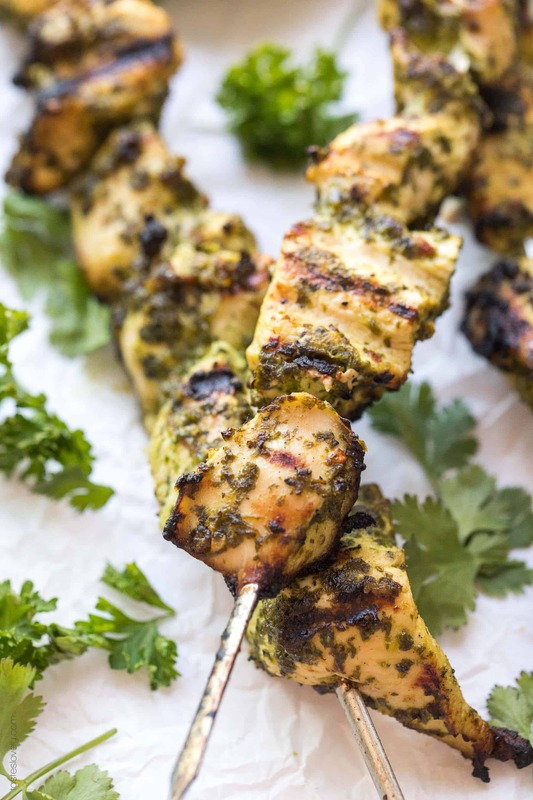 My 2 year old loves these paleo + whole30 chimichurri chicken skewers, and I love how healthy they are! Paleo, whole30, keto, gluten free, grain free, dairy free, soy free, sugar free, low carb, clean eating, real food. Combine the parsley, cilantro, olive oil, red wine vinegar, garlic, red pepper flakes, salt and pepper in a food processor. Pulse for about 10-15 seconds until just combined. you do not want to over pulse and turn this into a smooth sauce. 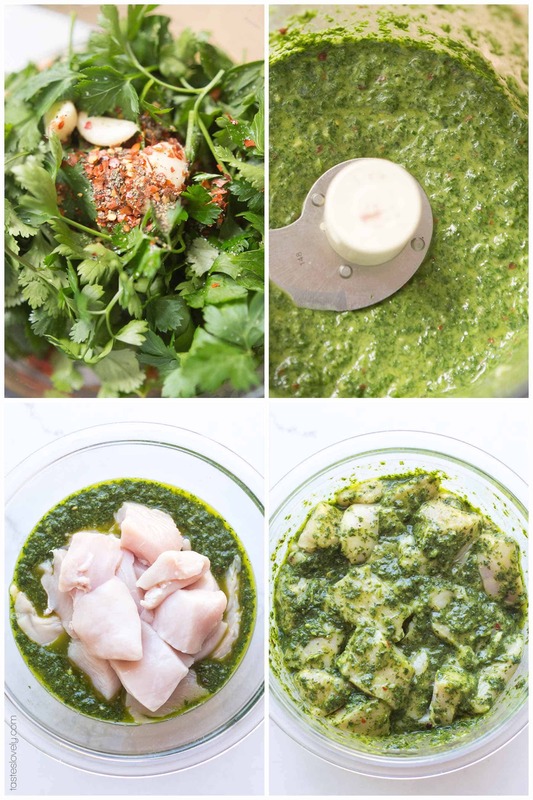 In a medium size mixing bowl, combine the cubed chicken and half of the chimichurri sauce. (Save the other half of the chimichurri sauce to serve as a dipping sauce for the cooked skewers). 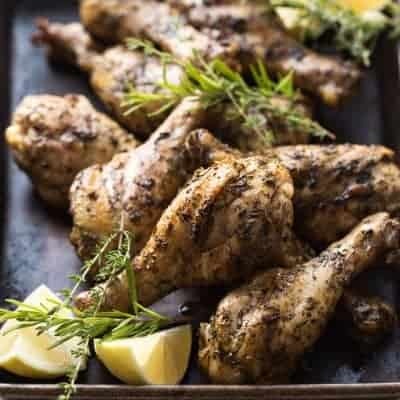 Allow to marinate for at least 10 minutes, or up to 1 day. Remove the chicken cubes from the marinade and thread them onto the skewers. Discard any remaining marinade. Preheat your outdoor grill (or indoor grill pan) over high heat. Cook the skewers until slightly charred and cooked to 165ºF using an instant read thermometer, about 10-15 minutes. Flip the skewers once when grilling. Remove the skewers from the grill and allow to rest for 5 minutes. Serve warm with remaining chimichurri sauce.